Click an image to return to the essential listening main page. Norwegian born Beady Belle first collaborated with Beate Slettevold Lech and Marius ReksjØ at the University of Oslo. Both Lech and ReksjØ worked together in bands such as Insertcoin and Folk & Røvere. In 1999, Pianist, composer and producer Bugge Wesseltoft asked Beate Slettevold Lech to record for Jazzland Records. Bugge had complete confidence in Lech, so allowed her complete artistic freedom. Lech took control immediately in all aspects of composing, writing, arranging, producing and programming on her own Macintosh computer. Marius ReksjØ also added his creative skills to this project, which after the inclusion of Beady Belle’s input eventually became Belle’s 2001 international debut release entitled “Home”. The track “Ghosts” was initially released as a promo single in Norway. The first international release contained the tracks “Ghosts” and “Moderation”. Work began on CEWBEAGAPPIC in spring 2002. This time around Lech and ReksjØ joined forces with Belle’s live band for a ‘wider musical image’. Released in 2003, CEWBEAGAPPIC most definitely raised an eyebrow or two internationally, with Belle also causing a stir with her more than memorable live performances. “CEWBEAGAPPIC”. The title is a self-coined word (CE stands for Complex + Easy, WB stands for White + Black , EA stands for Electronic + Acoustic , GA stands for Groovy + Ambient, PP stands for Played + Programmed, IC stands for Improvised + Composed)….! I appreciate the physical as well as the psychological! The first thing that caught my attention when I examined the sleeve notes… oops, I mean CD notes (can’t get vinyl out of my head), was Ms Belle’s legs! They seem to go on forever (see above images). I will of course discuss her music shortly...! The use (or abuse in some cases) of electronic gadgetry / synthesisers / processors in music today is almost as common as designer black leather sofas. The fusion of the above with acoustic instrumentation is also not a new phenomenon in the music world – But to do all the above tasks seamlessly and successfully can still be a hit and miss affair. Over production is still an issue, which plagues many potentially great albums. Today many of the worlds accomplished musicians can still leave you scratching your head with concern at their attempted electronic / acoustic blend. Beady Belle’s CEWBEAGAPPIC is an example of what can be achieved if the fusion is given space to breath, and allowed to form it’s own personality ‘naturally’. This album manages to achieve an almost ‘organic’ feel in places. I can imagine the few high street record stores ‘that are still around’ would have trouble categorising CEWBEAGAPPIC, or even Belle as an artist full stop. I am not going to help them out by trying to pigeon hole her either… I wouldn’t know where to start... The acoustic instrumentation (specifically double bass) and chord progression does tend to strongly suggest JAZZ. Belle is also blessed with an airy soulful voice, but again (apologies for repeating myself)… the blend of many genres is so successful, it is hard to pinpoint where the ‘genre lines’ cross. And that’s exactly how it should be! CEWBEAGAPPIC is both musically and lyrically beautiful. I know a few counsellors who would probably smile discreetly (or nervously) while listening to the couch complexities of “When my anger starts to cry”. The gently swaying, enchanting “Shadow” is the highlight on this album with it’s unpredictable ending, which will leave you breathless, with finger poised on the repeat button. This set overall has a delightful unpredictable edge, which keeps you gripped. The samples and loops are interspersed throughout giving a unique fresh feel to every track. I will definitely look forward to sampling further works from this Norwegian beauty. Perhaps she will allow me to photograph her on my own designer leather sofa? 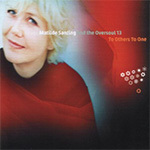 Click Matilde Santing's album to read her biography and album review. Go back to the essential listening main page.